Camping gas explosion at Cinderhill Road, Bulwell, on June 6. Picture courtesy of Nottingham Post. A Bulwell couple are lucky to be alive after a “massive” explosion ripped through their kitchen and living room, causing the roof to cave in. Structural engineers are now at the property in Cinderhill Road due to fears that the bungalow will collapse. Fire crews were called to the devastation at around 4.15am on Wednesday, June 6. Paul and Vanessa Bowen say the explosion was so strong that it blasted out the living room windows and shattered the bricked walls of their bungalow. Vanessa, 29 said: “If we had been in the living room at the time I think we would have been dead. “We had three fish tanks and they have gone. I am devastated and numb. At the moment what is running through my head is where is my cat and all my stuff is in that house. Vanessa’s husband and friend, who also lives at the property, were taken to hospital with minor injuries after they clambered through the debris to find the missing cat. The fire service said it is believed that the explosion was caused by a camping gas cylinder. 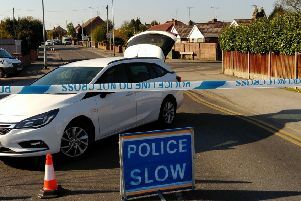 Mrs Bowen added: “I was just about to put my head down and we heard a massive explosion. We jumped out of bed and got to the hallway when we noticed the living room door had come off and the living room was a mess. I could see orange spurts in the kitchen. My first thought was the cat. “Our propane camping cooker was on fire and we managed to put the flame out. I had not taken notice of the damage - my main priority was finding the cat and dog. Nottingham City Homes, which own the property, said they would rehouse the tenants temporarily whilst assessments are carried out. “There is a possibility that the roof could collapse, and so the area has been cordoned off and props put in place,” a spokesperson added.